At a time when the importance & relevance of the Internet & Networking Websites reach all time highs, introspectively; their influence on individual perception & the world community grows exponentially; Reggae Star Melekel makes his mark. 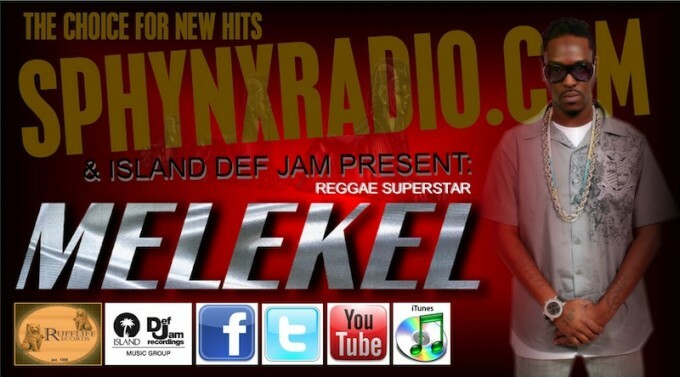 March 11, 2012 - PRLog -- Sphynxradio.com, The Choice For New Hits, is proud to present International Reggae Star "Melekel" with our Certificate of Award for a record setting 23 Consecutive Weeks at #1. Since October of 2011, Melekel has maintained a strong presence on the air which has impacted his career positively & allowed him to reach thousands of fans worldwide. In his 23 weeks at the #1 spot, he has gained multiple new fans & has been offered numerous opportunities as a result of an unwavering drive to succeed. Melekel's current single available at Itunes on Island Def Jam, "In Da Hood" Featuring Yung Joc has surpassed 10,000 downloads; a testimony to the value of exposure. He is commended by our Staff for his community involvement, support of Veterans, & continual social awareness in Arts. At a time when the importance & relevance of the Internet & networking websites reach all time highs, introspectively; their influence on individual perception & the world community grows exponentially; Reggae Star Melekel makes his mark & blazes a trail for artist of multiple genres to shine on the World Stage. We congratulate Melekel for this Epic Achievement & offer best wishes in his new venture with Jimmy Iovine's Interscope Records. Sphynxradio.com is the leader and innovator of a large network of artist & fans, intermingled to form the ultimate live radio and social network experience. We are a Member based dynamic Internet Radio Station, offering Artist/Bands and their representatives 24/7 live presence on the radio, digital distribution with a major label, access to thousands of potential fans and much more.